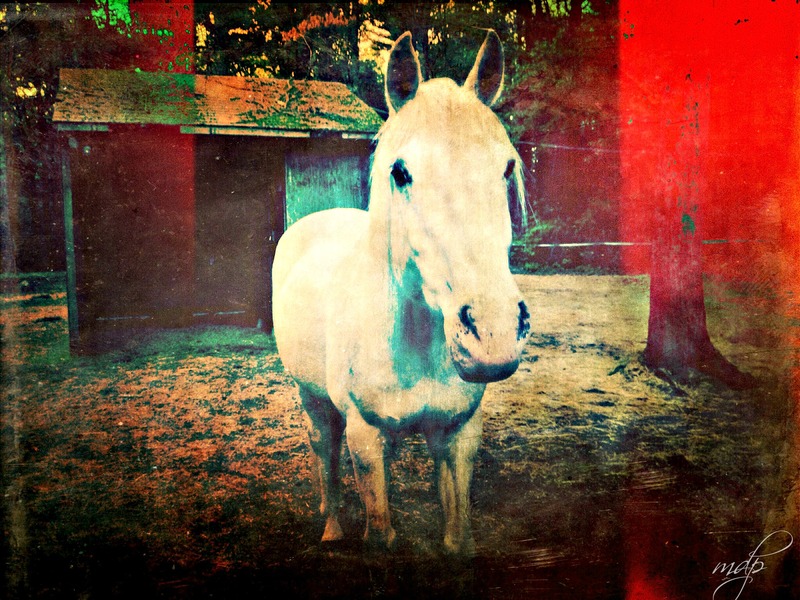 If Andy Warhol came back as a horse . . .
Would he look like this? A friend of mine has a horse she calls Rohan. She also owns a tiny horse called Hobbit. (She’s a huge LOTR fan.) I took this photo of Rohan last month and then played around with it using various photo apps. The picture makes me think of Andy Warhol. What does this have to do with anything? Nothing. I just liked the photo. It’s fun. It’s summer. And I’m not really here. If you want to read something, though, here’s a VERY brief encapsulation of my entire life accompanied by 6 meaningful songs (plus a bonus track). I’m featured with the very cool Hippie Cahier over at Life in 6 Songs. It’s a fun read, plus there’s great music. What could be better than that on a summer’s day? 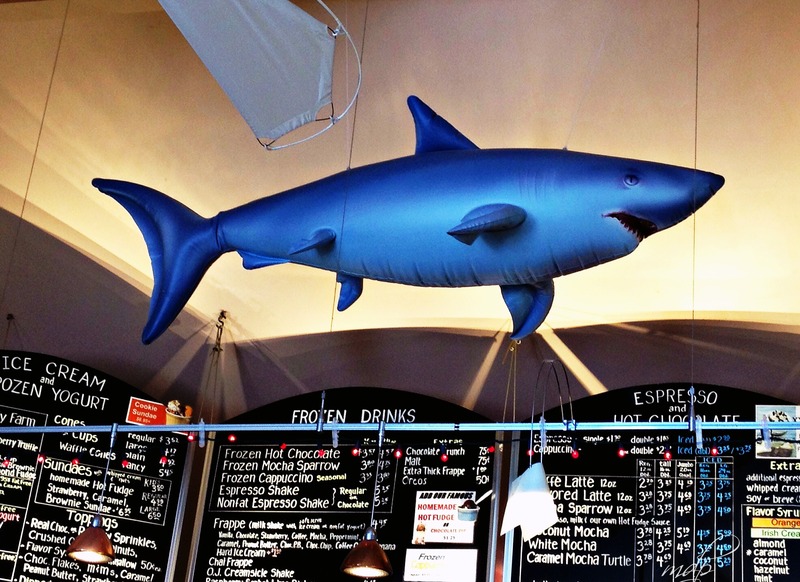 In a shop on Cape Cod — Ice cream, frozen drinks, espresso, and a shark. I chose the espresso. 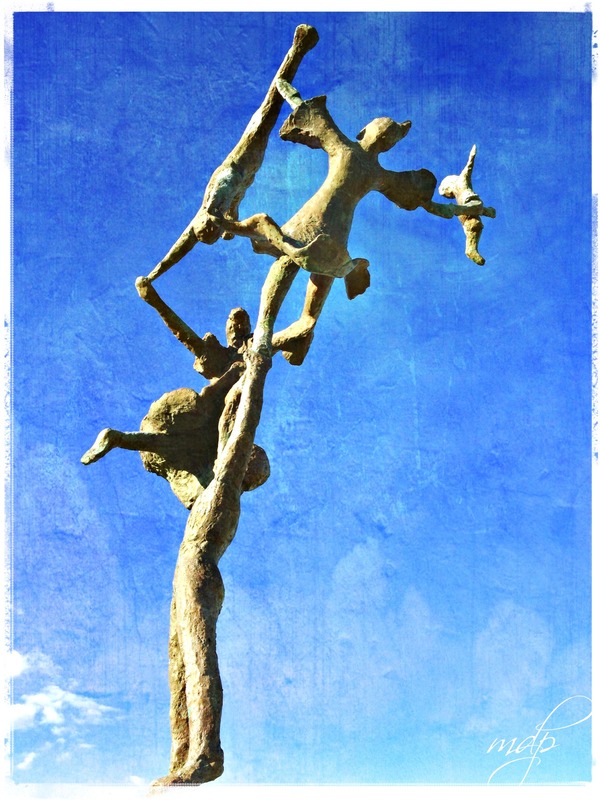 Sculpture by Anne Mimi Sammis. Located at Narragansett Beach, RI. Lately, I’ve been working on HAPPY — that elusive state of being that people are always trying to achieve. Seems like a good summer project to me. I’ve been on antidepressants for fifteen years, and I recently decided to wean myself from them. I want to see what difference fifteen years of living and learning has done for me. So far, so good. As an exercise in mindfulness (or as mindful as my over-active brain will allow), I’ve started making a list of the things that bring me joy. Sometimes, I surprise myself. Always put butter on your bread when making sandwiches. Because who really wants dry bread? Stand up straight. Your spine will thank you. When I was in my early twenties I took beginning ballet lessons for a couple of months. It was hard, but exhilarating. I know what a plié is. The ballet teacher taught us to picture a puppet string sprouting from the top of our head pulling us upright. I still imagine this. Swim in creative waters every day. See a rose in the dandelion; a butterfly in the wasp. Paint a word picture. Sing a story. Make some noise and call it a song. If you are lucky enough to have stairs in your home, run up them whenever possible. Taking them two at a time is even better. Move your body. Shake it, wiggle it. Dance your feet off. Promote yourself to the Ministry of Silly Walks. Always taste the ice cream as soon as you get it home. The amount of pleasure you get is commensurate with the meltiness at the top of the container. Be satisfied. If you can’t be that, be patient. (I’m holding out hope that eventually I will own a car with four doors instead of two. It doesn’t have to be brand new.) Stuff has a shelf life. Memories last a lifetime. Embrace your fear. I am afraid of heights. This does not bother me. I don’t believe I am missing out by not conquering this fear. I have no need to climb mountains, parachute from planes, or bungee jump from insanely high bridges. If anything, I’m increasing my chances of avoiding serious injury or premature death. Laugh. Because, endorphins or something. It’s easier on your shins than running, and doesn’t make you sweat. Be kind. Because, duh. Kindness is as simple as smiling at a stranger. It reverberates through the universe. Read out loud, even if it’s only to yourself. If you have them, read aloud to kids. The happiness quotient raises exponentially with the number of kids. There. Wasn’t that fun? Now you do it, go out and create your own list. What makes me happy is not a panacea. Happiness isn’t a one-size-fits-all kind of thing. Keep adding to the list. That’s what I’ll be doing. And if you’ve a mind to, feel free to share the things that make you happy, too. One day soon they will learn to fly. in the life of us. 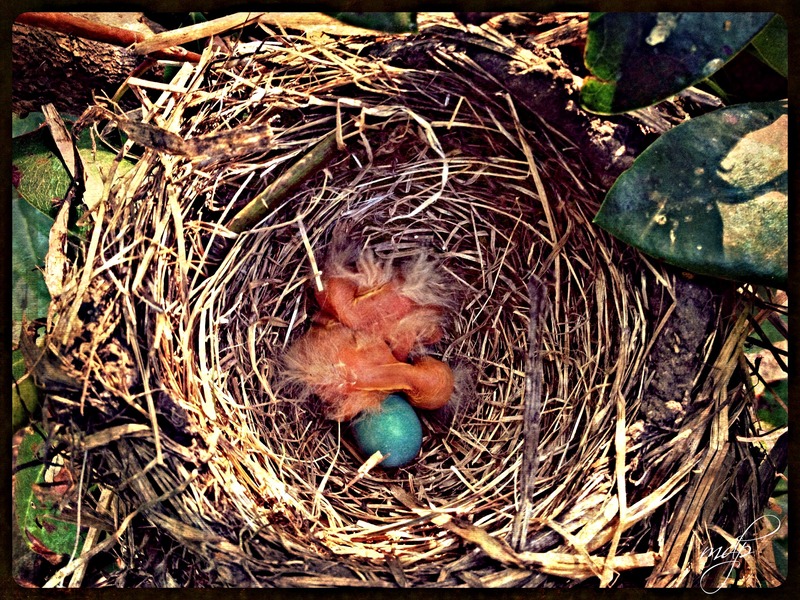 Several days ago my husband discovered a nest containing newly hatched baby robins in our rhododendron bush. I took a photo with my phone. I keep looking at the picture, amazed that such tiny creatures are able to survive at all. How is that even possible? I mean, look at them. They have scant feathers and see-through skin. Their spines are a yellow dotted line down their backs. They cannot hold their heads upright. Something in the fragility of these babies made me think of a night long ago. My sister was visiting from Virgina, about to move to California. My brother was still alive. I convinced them to go with me to see the movie, Cinema Paradiso — a magical film about childhood and how it shapes who we become. Afterwards, we went to a bar where we drank wine and wrote poetry on paper napkins. Then we sat in a park, talking into the night until one of us was sober enough to drive home. I kept all of my napkin poems from that night twenty-four years ago. Dated and numbered, yellowing and stained; seven of them in all. I don’t know if my sister still has hers. I wish I had my brother’s. I don’t remember what started it, the writing poetry on napkins. Most likely the wine and the movie, the looking backwards to the past. Wondering how any of us survive the chaos that comes with growing up? We were so fragile then, our dreams as transparent as glass. Our poetry so self-confessional. But survive, we do, for a time. Some of us longer than others. 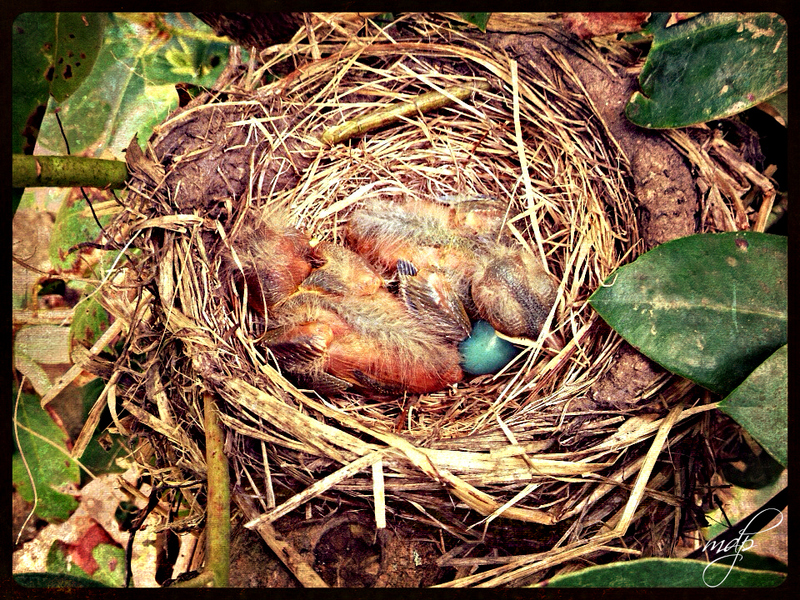 The baby robins are thriving. Which is a miracle to me. In five days they have doubled in size. Their feathers are coming in and there are the shadowy buds of wings that will eventually lift them from their nest. I hope to bear witness when they do. Five days old. A crowded house.